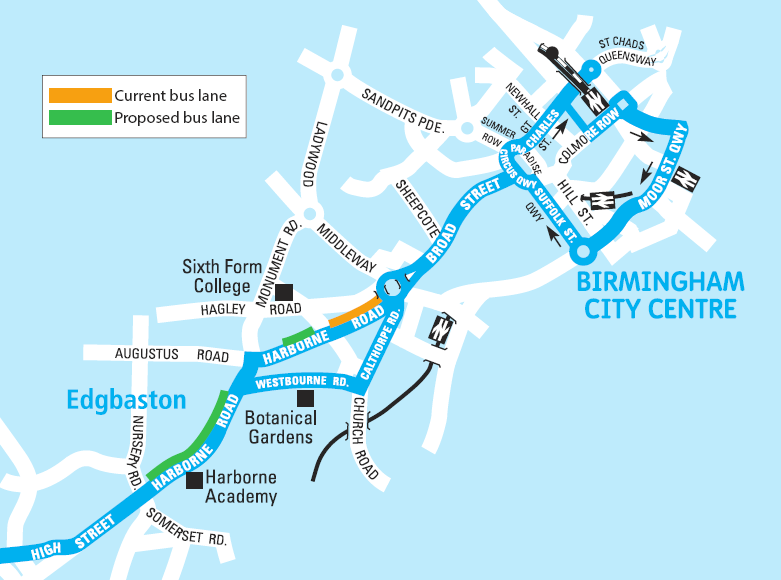 In March 2018, Transport for West Midlands, in partnership with Birmingham City Council, consulted on proposals to trial bus lanes along Harborne Road towards the city centre, between Kingscote Road and Highfield Road. We received a positive response to the consultation with nearly 600 responses and 77% of respondents supporting the proposals. We will be going ahead with the bus lane with associated changes to parking and waiting (yellow line) restrictions. Following public consultation, there have been some changes to parking restrictions in the scheme, to further support bus journeys, ensure timings of restrictions are consistent and to improve visibility for vehicles turning onto Harborne Road. The final scheme plan can be viewed at www.birmingham.gov.uk/harbornebuslane. The scheme will be introduced under Experimental Traffic Regulation Order Powers, meaning you can make comments at any time in the first six months of the trial - to 4 April 2019. More about how to submit comments. skip straight to the questionnaire. In the morning rush hours, up to 22 buses per hour travel along Harborne Road between Harborne High Street and Five Ways, carrying 1,500 passengers - more than the number of people travelling by car. The route is, however, one of the most congested corridors on the approach to the city centre where it is often quicker to walk than catch a bus. We have already started to improve the quality of the journey for bus passengers by working with bus operators to provide new high quality hybrid buses. We now want to speed up the journey by introducing bus lanes, taking buses out of congestion. The council and Transport for West Midlands have secured funding to deliver a bus priority scheme between Harborne High Street and Highfield Road, through the Government’s National Productivity Investment Fund. This first stage is to trial a new part time (7am to 10am Monday to Saturday) bus lane along Harborne Road towards Birmingham, between Kinsgcote Road and Highfield Road, connecting into the existing bus lane on the approach to Five Ways. The new lane is not expected to reduce the road capacity for other vehicles. Some stretches will be in space currently used for parking, meaning there will be changes to on-street parking arrangements along the route. When the bus lane is not in operation, any vehicle will be able to use the lane. The bus lane would be introduced as a trial for a minimum of 12 months, during which we will measure the effect on bus journey times. The trial would use experimental traffic regulation order powers, allowing the public to formally submit comments at any time during the first six months of the scheme. The trial will allow us to assess the effects on all modes of transport. If the trial is successful, we will seek to make the bus lane permanent, taking into account comments received during the trial period. At the same time, we are consulting on some road improvements in the city centre to support the extension of the Metro tram from the city centre to Five Ways and Edgbaston via Broad Street. This bus lane on Harborne Road works with those proposals to support our vision for an integrated public transport network, with fast movement through some of the most congested sections of the road network. Download a map of the proposals at the bottom of this page. An inbound (towards city centre) bus lane from Kingscote Road to Hawthorne Road, operating 7am – 10am Monday to Saturday. The parking bays on the same side as the bus lane will be amended to prohibit parking 7am - 10am. Parking will be prohibited at all times on the opposite side to the bus lane to ensure two lanes of traffic are retained. Loading/unloading in the bus lane will be banned for the hours of operation. An inbound (towards city centre) bus lane from Vicarage Road to Highfield Road Road, operating 7am – 10am Monday to Saturday. The parking bays on the both sides of the road will be amended to prohibit parking 7am - 10am and 4pm – 6.30pm. The addition afternoon restriction will ensure that general traffic can flow at this busy time. The parking bays on the north side (in the existing bus lane) will be amended to prohibit parking 4pm to 6.30pm in addition to (existing) 7am–10am. This is to ensure that general traffic can flow at this busy time. It is proposed to reduce the length of on-street parking on Vicarage Road, between Harborne Road and Westborne Road. The on-street parking currently restricts two-way traffic flow, sometimes leading to cars queuing back onto Harborne Road and blocking traffic. This proposal will reduce the likelihood of this happening. A yellow box marking will be introduced at the Harborne Road junction with Vicarage Road and Highfield Road to further reduce the likelihood of vehicles blocking the junction. Bus stop markings on Harborne Road will be extended where they fall within parking area to ensure that a bus can use the bus stop when vehicles are parked in the bays. All existing sections of no waiting at any time will remain. To improve safety, the bus stop closest to Brook Road, towards Harborne, will be moved closer to Richmond Hill Road.